I’ve mentioned before that this stage of my life has turned me into a little bit of a non-shopper. The truth is, I don’t dress in cute clothes much during the week, and I’ve found that since I’ve started working from home my “need” for clothes has really decreased. However, I don’t know if it’s spring or what but lately I’ve been feeling the shopping itch. I can’t really justify expanding my wardrobe right now, so instead I thought I’d share what I’ve got my eye on with you guys. I recently found myself with a JustFab credit, and I couldn’t pass up those blue and white polka dotted pants. I really like them, but now that they’re here I’m having trouble finding something in my closet that I want to pair with them. Would you rock polka dotted pants? If so, how would you style them? When I made this board, I set out to pick a lot of white options, but now I see that I didn’t include a single one. I think a cute white top would be a good choice, I just didn’t come upon any that I loved in my search. I think the fact that there’s so much mint and turquoise in here is just a testament to the fact that I subconsciously want to dress like my blog. Note: I’m not sure if the link for the pants will work unless you have a JustFab account. If you decide to sign up, use my invite link! If you do it just means that I’ll get points that I can use to get free stuff. This post contains affiliate links. I love them with the red top! I would have never thought to pair them with that red top, but I absolutely love that! So bright & fun! If you are still leaning towards white, you should find a cute white peplum top. I bet they have some good finds at Asos! That’s a good idea- I forgot to look there! Peplum actually crossed my mind when I was coming up with this post- I need to get better about writing down my ideas, clearly I’m all over the place! Those pants are amazing! If I were to style them, I’d probably just wear a black top. Boring, I know. I do like Emily’s suggestion of the red top though! I think a pretty buttercup yellow top would be cute too. I have a pair like that, though the color is a little lighter. I tend to wear them with a chambray shirt, or my yellow sweater. I also had a pair of red polka doted pants (I love them), and those are a little more difficult. Again, the chambray shirt (because chambray goes with everything) or something else solid. I think yours would go with another print well, but you almost have to make the print something that really stands out and makes a statement together (like stripes or floral). I love the idea of that top, middle shirt with the pants. Perfect for spring! 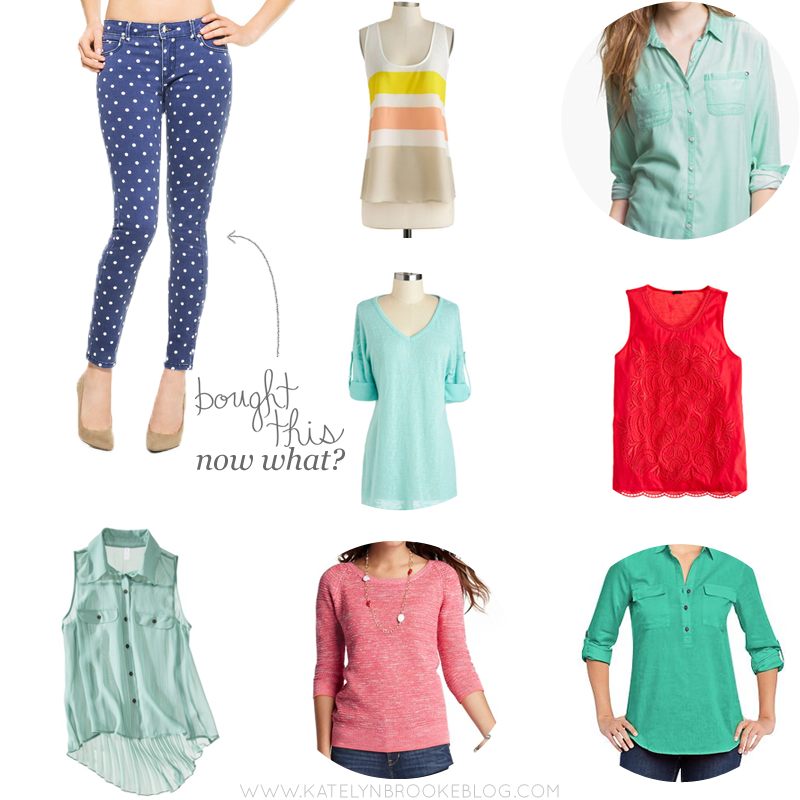 i love all things polka dot and stripes. what fun! i love polka dot pants. i wear mine with EVERYTHING! I adore mine. Enjoy yours!